Members of the Nicasio Parlor, Native Sons of the Golden West, march down Petaluma Boulevard. Time to put on your yellow and white gear and turn out for Butter and Egg Days. 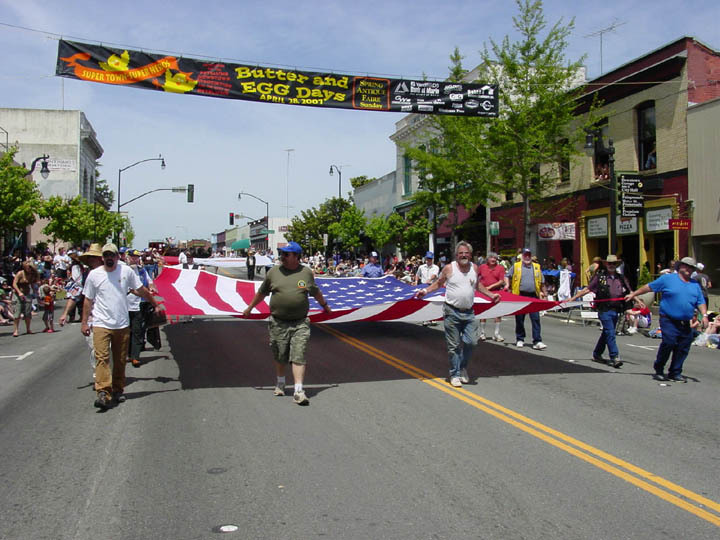 Celebrate Petaluma’s glory days as the World’s Egg Basket at the Butter & Egg Days Parade and Festival. This year’s theme, “Home Grown Petaluma,” celebrates all things hatched, incubated, planted and raised in our home town. The yearly celebration of the city’s agricultural roots begins at noon, Saturday April 19 at the Petaluma Museum, Fourth and B streets, with the presentation of this year’s Good Egg award to John Crowley. The week that follows is designated History Week, culminating in the 33rd annual Butter & Egg Days Parade. The party starts at 8 a.m. Saturday, April 26 with the Petaluma 7-11 Lions Club’s breakfast in the parking lot across from Putnam Plaza on the Boulevard North. At 10 a.m. comes the cow chip-tossing; at 10:15 the Cutest Lil Chick contest and, at 11:30 p.m. a pre-parade for kids. 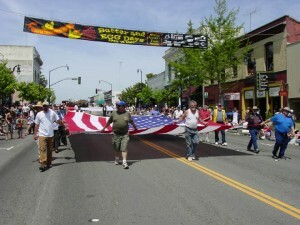 The parade itself steps off at noon April 26th from the corner of Fourth and D streets, marches down Fourth/Kentucky streets, turns right on Washington Street, then marches south down Petaluma Boulevard to Walnut Park. Then, on Sunday, April 27, downtown goes gloriously old school from 8 a.m. to 4 p.m. at the semi-annual Downtown Antique Faire. For more information, visit petalumadowntown.com or call 763-0344.